If you hop on the ferry from Amsterdam Central Station to the city’s northern suburb of Buiksloterham, you’ll find De Ceuvel, a sustainability incubator that’s been stirring up global curiosity as one of Europe’s most unique office parks. At first glance, it’s clear that De Ceuvel has a story to tell. 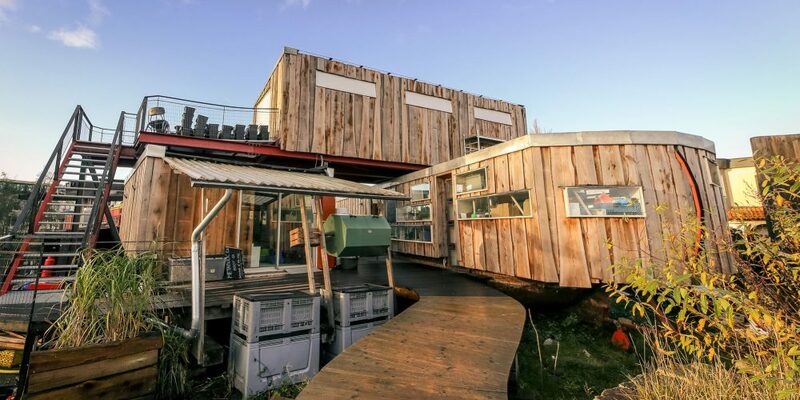 Upcycled materials define the indoor-outdoor space, offices are located in refurbished houseboats, solar panels are fixed to most structures, and an aquaponics greenhouse supplies greens to the buzzing on-site restaurant. The entire operation is a ‘cleantech playground’ for experimenting with sustainable technologies, and local and international communities are encouraged to come and see how it works. Many businesses around the world are working towards more sustainable and circular office environments. Organisations face growing pressures to operate within more sustainable boundaries, with resources becoming increasingly scarce or expensive, and waste management a challenge for most businesses. 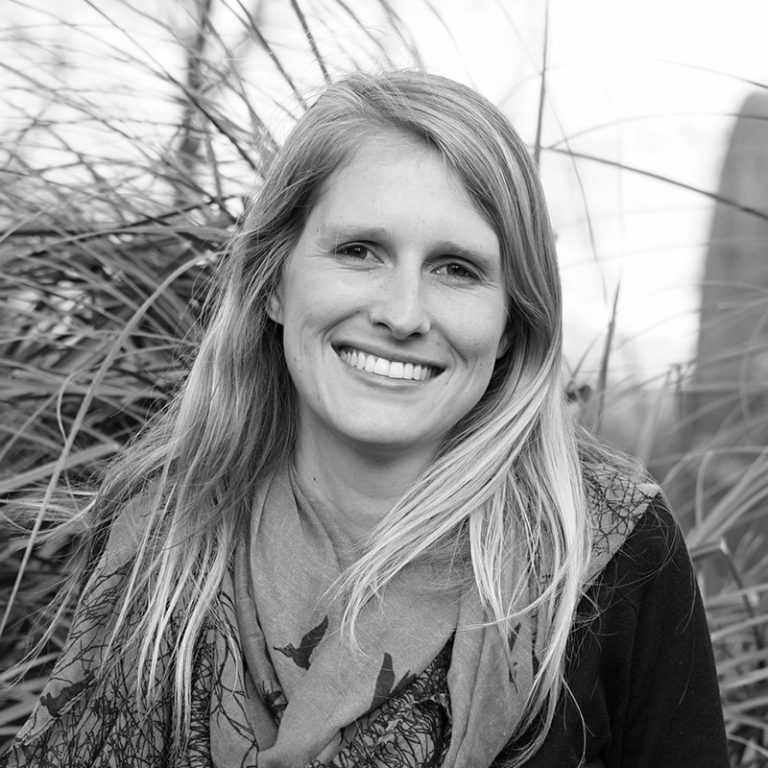 A circular operation that is waste-free and regenerative by design can help transform waste into valuable resources, resulting in reduced environmental impact and, often, financial gain. In addition to this, there are growing bodies of research highlighting the importance of greener buildings for employee productivity, health and wellbeing. 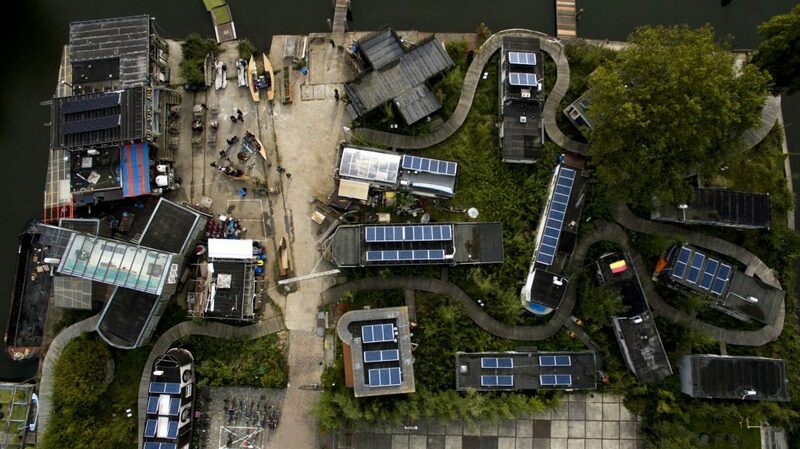 De Ceuvel is Amsterdam’s ‘living lab’ for circular urban development. A regenerated urban space that focuses on cutting edge technology, sustainability and community interaction, it allows the city to test out new ways to envision and create circular offices and provides a unique and innovative way of thinking as inspiration for workspaces wanting to transition towards a more sustainable model. While there is no ‘one-size-fits-all’ blueprint for a circular office space (and, of course, not everyone wants to relocate their office to a houseboat), De Ceuvel aims to educate and inspire others to think how workspaces could be different. Aligned with the core principles of the circular economy, it focuses on ‘closing the loops’ on its local energy, nutrient and waste cycles. And its tangible examples of these approaches can provide valuable learnings for other urban hubs to build upon. De Ceuvel sees over 35,000 visitors each year and has won numerous awards for sustainability innovation. Built in 2014, it is home to 17 workspaces – leased by a range of small businesses, artists and creative entrepreneurs – as well as an assortment of event and workshop venues, and a sustainable café-restaurant. The site on which De Ceuvel exists was formerly a derelict shipyard. 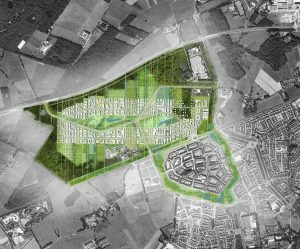 In 2012, Metabolic and a group of organizations won a tender to turn the site into a ‘regenerative urban oasis’, securing a 10-year lease on the land from the Municipality of Amsterdam. 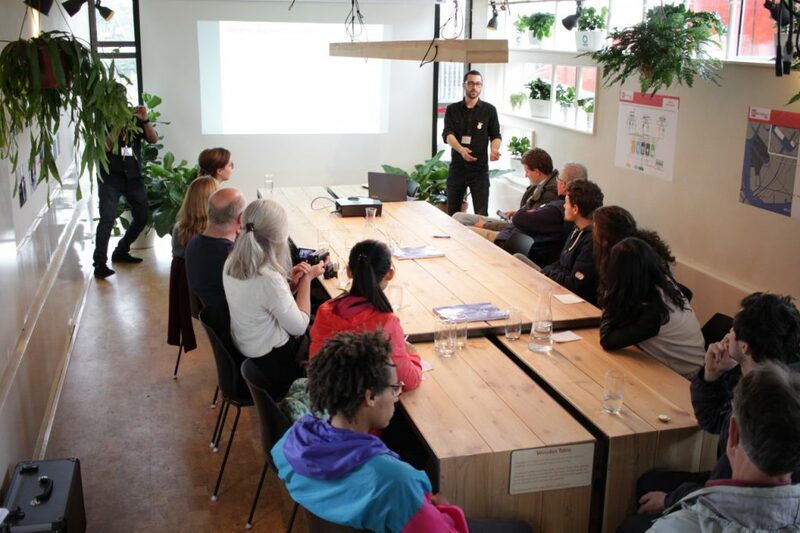 Metabolic played the role of providing the sustainability plan for the site, and together the consortium of partners has helped the City of Amsterdam transition this dilapidated and polluted zone into what is now a sustainable community hub and workspace. To clean the polluted soil, the land beneath the buildings has been covered with specialised plants that absorb and break down pollutants through their roots in a process called ‘phytoremediation’, a useful ecological solution that can be used to clean up polluted sites in urban areas. The offices themselves are made largely out of upcycled materials, with old houseboats lifted onto the land and renovated into offices, and the café is created from an old lifeguarding kiosk, complete with 80-year old nautical bollards. De Ceuvel is as much a workspace as it is an active community hub. 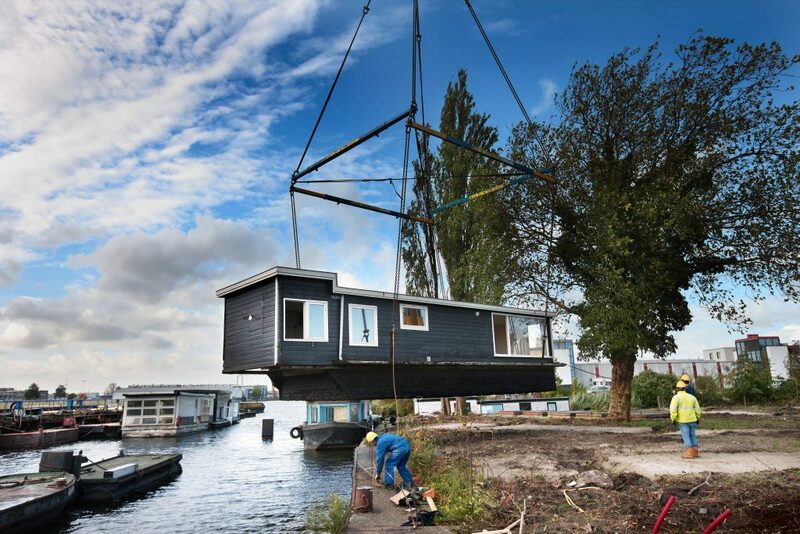 The creative and social enterprises that rent the houseboats-turned-offices are custodians of the sustainable technologies and initiatives on site and are required to spend 40 hours a year working within and further developing De Ceuvel. This fosters a sense of community and encourages unique interactions between the tenants. The culture of the space is one where its occupants have bought into the collective ideals and vision for a more sustainable and circular community. This is complemented by the energy and enthusiasm that comes from the people of the surrounding neighbourhood, who are encouraged to use De Ceuvel as a cultural and community hub to come together, enjoy shared experiences and get involved in creative projects. One such initiative brings together ‘makers and doers’ from Amsterdam North to experiment with creative re-use, a product of which was De Ceuvel’s Het Ware Noorden Light Festival installation, which showcased upcycled objects turned into light art. This was also a chance to bring more people into contact with the businesses on site and to learn more about sustainability thinking. The broader national and international community is drawn into the fold through Metabolic Lab, an on-site learning lab where organizations and individuals can learn about applied sustainability and how they can make an impact in their own communities and organizations. 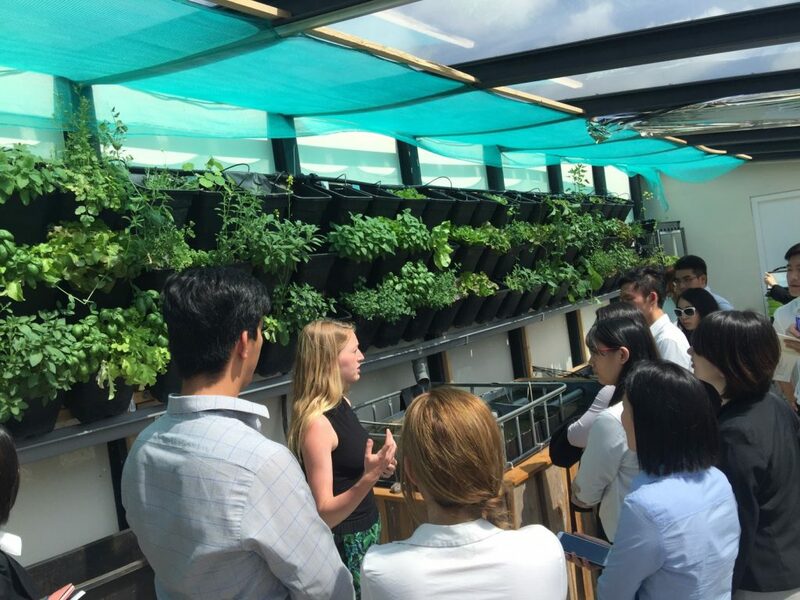 Metabolic and a range of external trainers provide a variety of educational programs, workshops and masterclasses, ranging from strategies for urban transformation and circular cities, to practical skills such as building aquaponics systems. The programs cater to all organizations and types, with the intention that the circular economy knowledge, learnings and potential are widely shared and more people are empowered to achieve circular ambitions. Waste is often one of the first places businesses start when exploring circular initiatives for their office environments. Clever use of technology has transformed De Ceuvel’s workspaces into being professional and ‘gezellig’ (Dutch for ‘cosy and friendly’), while at the same time demonstrating real ways to close resource cycles and be more self-sufficient as a local system. There is not much that is ‘wasted’ – instead, all waste is seen as a resource. Kitchen wastewater from each office boat is filtered through helophyte filters (a natural mix of sand, gravel, shells and plants) before being released into the ground as a purified water source. All garbage waste is separated and sorted for recycling. And each boat is fitted with a compost toilet. Contrary to conventional flushing toilets which produce wastewater that is discharged into the sewer, dry toilets produce solid compost which can be harvested for high nutrient value. Urine is collected separately and passed through a struvite reactor, which produces the phosphates needed to create fertilizer for local food production. Businesses are well positioned to tackle challenges like food waste and employee health by changing office practices and raising awareness of broader food-related sustainability issues. The café at De Ceuvel goes out of its way to serve sustainably and locally sourced food – so local in fact, that some of their herbs and vegetables are grown right next door. The aquaponics greenhouse, situated above Metabolic Lab, showcases how clean technology, food production and nutrient recovery systems can be integrated into urban environments, resulting in more efficient food production and lower food miles. It combines fish and vegetable production in a closed-loop system, where fish excreta provide nutrients for the plants, and the plants filter the water for the fish to live in. Essential nutrients for food production are also provided by the worms from the on-site composting bin, and from the struvite reactor which collects and processes urine from some of the offices. Most businesses are concerned about their energy efficiency, with costs and carbon emissions important factors to consider. At De Ceuvel, over 150 solar panels have been fitted onto the office boats and all heating needs are met with solar energy. Heat exchange ventilation systems are also fitted to each boat to maintain the heated environments more efficiently. 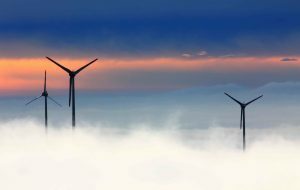 Recently, Metabolic’s renewable energy venture Spectral created a blockchain-based energy sharing token called the Jouliette, which allows the De Ceuvel buildings to track their energy usage as well exchange energy locally (dependent on whether they are producing an energy surplus or drawing a deficit). Through this, points are generated and distributed among the De Ceuvel community, and users are rewarded for smart and efficient usage of power and solar panels. In the café, you can see a live map of the site, showing where the energy is being generated, traded and passed back to the grid, making a positive, renewable contribution to the power needs of the city. While all these initiatives are underway, it’s important to note that De Ceuvel is continually evolving. It is a living lab for ongoing innovation and continuous improvement, and the local community has the opportunity to build and steer many of the initiatives taking place. The solutions it has generated are not circular economy ‘silver bullets’, but by being visible – and practical – they encourage participation and innovation, and inspire progress, and the momentum generated is already leading to other major circular initiatives across the city. Most importantly, De Ceuvel’s unique approach can serve as an inspiration for any organization, no matter where they are on the road to circularity. If you’d like to find out more about De Ceuvel, please visit www.deceuvel.nl or mail Chandar van der Zander (chandar@metabolic.nl) with any questions.